Center City Building at 40 SS. Main St. has been awarded $5 million in tax creddits - a big move that could push along its development. 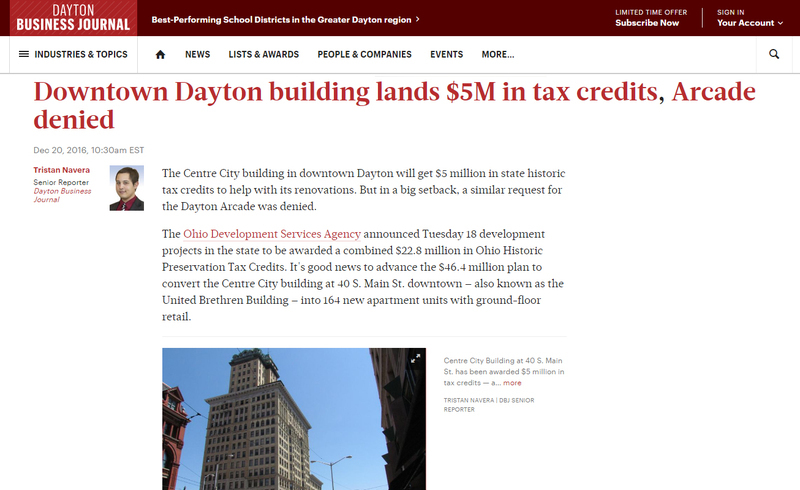 The Centre City building in downtown Dayton will get $5 million in state historic tax credits to help with its renovations. But in a big setback, a similar request for the Dayton Arcade was denied. The Ohio Development Services Agency announced Tuesday 18 development projects in the state to be awarded a combined $22.8 million in Ohio Historic Preservation Tax Credits. It's good news to advance the $46.4 million plan to convert the Centre City building at 40 S. Main St. downtown — also known as the United Brethren Building — into 164 new apartment units with ground-floor retail.